The Computer Based Examination in respect of the Stenographers Grade ‘C’ & ‘D’ Examination 2017 was held from 11-9-2017 to 14-9-2017 at different centres all over the country. The candidates’ response sheet along with the tentative answer keys are now available on the link given below. The candidates may log-in using the same ‘ID’ and ‘Password’, which were used by them during the Examination, to download the same. 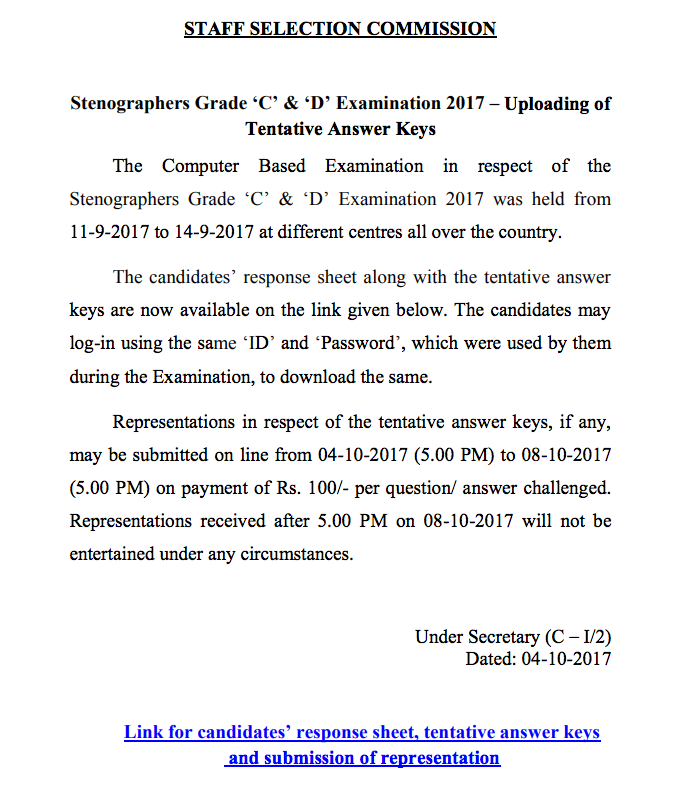 Representations in respect of the tentative answer keys, if any, may be submitted on line from 04-10-2017 (5.00 PM) to 08-10-2017 (5.00 PM) on payment of Rs. 100/- per question/ answer challenged. Representations received after 5.00 PM on 08-10-2017 will not be entertained under any circumstances. Important : Please share your response sheet (question paper with answer keys) with team qmaths by emailing your sheet at qmaths.in@gmail.com. Your privacy will be maintained.